Travelling to the bush at the tail end of rainy season means you really have to get into birds if you aren’t already. In the dry season in Hwange National Park, many thousands of elephants in huge herds – just part of a population of 75 000 – can be seen, along with herds of buffalo, prides of lions, cheetah leopards and wild dogs. The park has no natural water source and so when it’s dry, the animals are forced to congregate around the man-made waterholes fed by boreholes. Rainy season is a different story. The bush is thick, green and lush, water is plentiful, and the tens of thousands of elephants and other animals tend to stick in the middle of the park, where there are no roads and they don’t have to contend with being gawped at by camera-wielding safari tourists. This beautiful emerald green time of year is, however, amazing for bird life – especially for migratory birds who’ve flown down from Europe for the summer like Germans who have beach houses on the Atlantic Seaboard in Cape Town. Appreciating the beauty and abundance of the rainy season is all about being a twitcher. My Hwange green season stay was at Elephant’s Eye, a small intimate lodge in a private concession that borders, unfenced, on the massive national park. Elephant’s Eye has just eight spacious rooms built on stilts overlooking a waterhole (populated by a pair of grey crowned cranes down for a migratory visit from Central Africa when we arrived) – wooden plank floors, thatch roofs and khaki canvas walls which open floor-to-ceiling with wraparound decks, outdoor showers, big bathtubs and even bigger beds, from where you can lie and gaze out on a sea of green. The intimage lodge is all understated, low-key luxury with a communal lounge with comfy big sofas, a sweet little bar and dining area with tables facing towards the outdoor fire that’s lit every night, and utterly charming staff who make you feel part of a big family. The first question our affable guide, Shepherd, asked was “What kind of birds are you into?” The answer was all of them, and off we set on long game drives into Hwange, where we did spot singular or small clusters of zebra, steenbok, wildebeest, impala and a big leopard tortoise but most of our attention was focused on the avian creatures. I had my Hwange bird list, and like a true bird nerd, ticked off species as we saw them – in one game drive alone we saw over 30 species. We watched a rufous-naped lark sing then flap its wings and turn its head 180 degrees just to check if anyone was encroaching on his territory, shaft-tailed wydahs flit around with their elongated black tails and golden plumage, and marveled at the bright ruby red crimson-breasted shrikes. Back on Elephant’s Eye’s concession, we did short walks in the bush with walking guide Joshua, who was a fount of knowledge on all things nature. Walking a few hundred metres took us about two hours, as we stopped to examine the amazing world inside a disintegrating elephant poo, learned to read kudu, buffalo, warthog and impala tracks, picked wild basil and found out the medicinal (and aphrodisiac) uses of plants and trees. In between game (bird) drives and walks, we ate tomato pasta, savoury veggie-filled pancakes and homemade Amarula ice cream back at the lodge, relaxed at the natural water swimming pool (which the elephants and buffalos drink till empty during the dry season), took unplanned for siestas in bed, lulled to sleep by the whirr of crickets, did some bird watching from the couches in the lounge with a bowl of salted peanuts and cold Zambezi beers and visited the Painted Dog Conservation Centre to see the resident pair of beautiful (and highly endangered) creatures. My favourite time of day was going to bed or waking up. In the room only mosquito nets and canvas walls separate you from the outside world, and the sounds of nature are like an orchestra as you fall asleep: from champagne frogs, their croaks like the sound of dozens of champagne corks popping at once to the whoop of hyenas. In the mornings, bird song starts with a few tweets and works up to a crescendo of song, waking you up for another day in the wilderness. I was a guest of Elephant’s Eye Lodge during my trip to Hwange. Click here for more about this luxury lodge, which offers eight tented rooms on a private concession 13 km away from Hwange National Park. In the space of just over a hundred years, we’ve gone from the world’s first commercial flight (with just one paying passenger on a 40-kilometre route in Florida which took 23 minutes) to the dawn of space tourism. On average, eight million people fly somewhere every day. Today, the longest non-stop flight in the world – between Dallas and Sydney – is 13 730 kilometres and takes 17 hours and the biggest passenger plane – the Airbus A380 – can carry 853 people. Somewhere between that first commercial flight in Florida and the launch of the A380, we airline passengers have become blasé about flying. Instead of marvelling at the remarkable technology that allows us and our 20 kilogram suitcases to fly across the globe in a matter of hours, we complain about the annoying airport security checks, the delays due to storms, the lack of leg room, the bland meals and extra charges for heavy baggage. We also roll down our little window blinds and forget to look through the glass at the ever changing landscape below us unfurling by the second. Have a look at your fellow passengers right now. Can you see anyone staring out of the window? Probably not. When people first took to the skies they were utterly mesmerised by the view below them, but once the jumbo jet came along and the cost of air travel dropped significantly, the view from the plane window lost its appeal. We will pay a lot extra for a hotel room with a view of the sea, or book in advance for the table in the restaurant with the best vista but instead of marvelling at the kind of views once reserved for the birds most of us fill our hours of flying with work, movies, music, books and sleep. To bring back some of that sense of wonder that that fliers in the early 20th century felt, all you need to do is look out of that oval-shaped glass. Out there are 50 different types of clouds, some filled with more than 500 tonnes of water. You may be flying over ocean, where you can spot tiny white horses and the occasional cargo ship. Or maybe you’re cruising over the arid, sparsely habited Karoo: rusk-coloured mountains and plains scarred with carless roads and dry rivers.There could be a vast patchwork of farmed fields below you, or neat suburbia, with swimming pools like tiny blue jewels and roads like gridlined maths paper. Maybe you glimpse a dusting of snow on top of the Drakensberg or see an above-the-clouds sunrise so beautiful it looks like a dream. It’s a sad thought to think that the future of flying could be a viewless one. A UK-based development company is working on building windowless planes which could be flying within the next decade, replacing heavy aircraft windows with light smartscreen panels to cut fuel consumption. Instead of windows, screens covering the interior walls of the plane will project the sky outside – but would also allow you to browse the web and check your email. 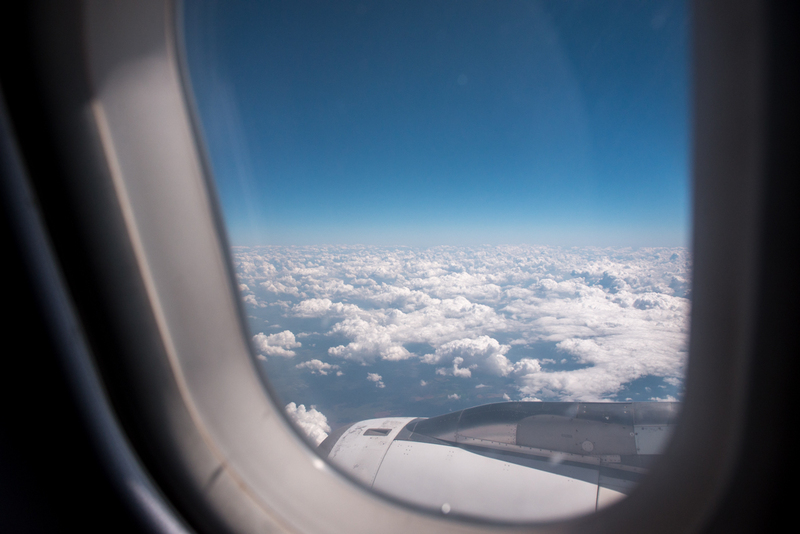 While cutting down on fuel would mean that airfares could be slashed, replacing windows with the equivalent of your laptop screen will take something irreplacable away about the magic of flying. Whether you fly infrequently or travel by plane several times a month, take a moment (or spend the whole flight) appreciating being 11 kilometres above the Earth, like Richard Branson, who said “There isn’t a flight that goes by when I don’t stare out of the window and thank my stars for what I’m seeing and feeling.” For two hundred thousand years we were constrained to the ground, and just a century ago we found a way to break free and take to the skies. Enjoy those spectacular window views while they last. A trip through national parks and wilderness areas of northern Botswana in rainy season: gliding through a channel of the Okavango Delta in a mokoro; flying above the Delta in a small helicopter above rivers and islets, water lily-studded lagoons and marshes full of birds; falling asleep in a canvas tent while lions roared outside; fuschia dawn skies; going on game drives for hours and not seeing another car; the sound of elephants wading through a stream in the dark; getting our Land Cruiser stuck in the muddy roads of Moremi and having to dig it out; giraffes, elephants, foxes, jackals, buffaloes, mongoose, hippos, red lechwe, zebra, wildebeest, hyena; Rex, our guide and driver, spotting a leopard tortoise the size of a palm in the middle of the road, stopping in time to help it cross; spectacular afternoon thunderstorms; baobabs full of leaves; flocks of yellow and white butterflies; the cry of fish eagles; a baby baboon doing a handstand on a picnic bench; one pink and purple sunset over the Chobe River that seemed to last forever; seeing two leopard lazing in a tree in the last moments of our last game drive in Chobe National Park; monkeys throwing seed pods at us from the roof of the Zimbabwean border post; standing under the mist of the Smoke that Thunders (Victoria Falls) and looking into a white roaring abyss. To read more about my safari to Botswana, read my blog here. Behind an inconspicuous wooden door marked only with a tiny sign on a side street of Tokyo’s Azabu-Juban district lies Gen Yamamoto bar. With just eight seats around a counter of Japanese oak, no music, no food and bare walls, this tiny bar is an spartan temple to cocktails. Here, the white jacketed Gen Yamamoto, who with his clean shaven head and soft spoken voice has the air of a monk, brings science and art together in his six-course tasting menus, which change depending on the fresh produce he can source from all over Japan. The drinks are sophisticated creations that have layered flavours and textures – such as a 12-year old Yamazaki single malt with mashed pumpkin from Hokkaido, milk and sesame seeds which tastes like the epitome of autumn – and the overall experience demands the kind of quiet reverence you’d usually reserve for fine art. In Japan, almost anything of worth – like cocktails – is elevated to the level of an art form, whether it’s flower arranging, the design of manhole covers or even the wrapping of packages in a shop, and in no place is this more evident than in Tokyo, one of the most culturally attuned cities in the world. In a metropolitan population of 38 million, Gen Yamamoto is just one of many artisans taking their craft seriously. With more Michelin-starred restaurants than anywhere else in the world, Tokyo is the ultimate culinary capital. Chefs take decades to perfect the art of making just one thing, like Jiro Ono, the 90-year old sushi master who was the subject of a 2011 documentary film. At his eponymous 10-seater restaurant, Sukiyabashi Jiro, located in the basement of a nondescript office building in Ginza, each 20 sushi course is presented by Jiro. The precision and artistry that Jiro applies to each piece of moulded fish and rice makes you realise that in Japan food can be so much more more than just something you eat. The more I see (and consume) of Tokyo – the bonsai gardens, the coffee shop with perfect iced cappuccinos inside a tiny wooden cube, the faultlessly curated design shops, the confectioners with sweets almost too beautiful to put in your mouth – the more I start wonder what it is about Japan that its culture is one of such craftsmanship and attention to detail. It’s only when I go to Kyoto – Japan’s spiritual centre of Zen Buddhism – that I start to make a connection between Japanese artistry and Zen. During my week in Kyoto, I immerse myself in Zen, visiting some of the more than a thousand Buddhist temples scattered across the city and its surrounding mountains. I experience a “rebirth” in the pitch dark cave womb of a Bodhisattva at Kiyomizu-dera Temple, sit in contemplative silence in front of a 15th-century rock garden at Ryōan-ji, shoot photos of the Golden Pavilion reflecting yellow brilliance off a still pond and wander the treed pathways of Ginkaku-ji where a massive cone of sand has been meticulously constructed to reflect moonlight back onto the garden. Each temple is an aesthetic paragon of minimalism, beauty and simplicity – all conspiring to facilitate the kind of meditation that I try to practice towards the end of the week. I spend a night on a futon mattress at Shunkoin Temple and awake at dawn to the ringing of bells for morning practice: zazen (seated meditation) takes place on the floor of the four-century-old temple with a view of the carefully manicured garden and its raked gravel patterns. Vice Abbot Taka Kawakami talks through meditation in a nutshell – how it is about conditioning the mind, so you can maintain inner peace and live in the moment, which is the essence of Zen. While one morning of meditation doesn’t have any effect on my caffeine-fast mental chatter, it’s in the zazen session that I realise that Japanese craftsmanship reflects the inner stillness that comes with Zen practice. Zen breeds a focused mind, a preference for minimalism, and a quest for the perfection of form together with a distilling of things down to their most core essence. It seems clear that it’s these qualities that shape the approach people in Japan bring to their craft. And to consume something done expertly in Japan – drinking cocktails, admiring bonsai, slurping a bowl of ramen noodles – is to have an experience so immersive and so anchored in the here and now that it’s not far off from the presence of mind that you aim to reach in zazen. There’s a lot to love about Japan, but for me this is where its true magic lies.